iRacing Setup Sync (or iRSS for short) is a Windows application that attempts to automate most of the tedious work around storing and managing your setups. It operates on a large database of setups, which is synced to most of the popular Setup Shops on the forum and therefore always contains the latest setups, even those shared on the forums. 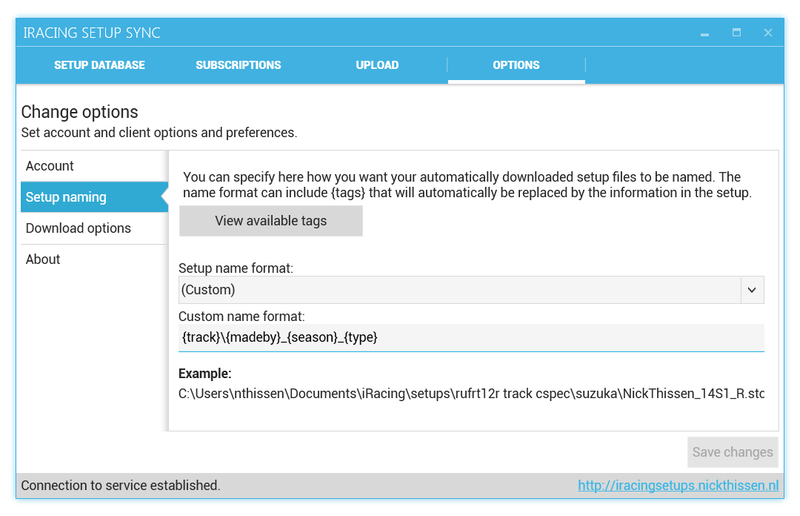 It allows you to browse setups by car, track or team and automates downloading the setups into the correct folder, and it can even automatically download setups for the car / track you are driving right now! 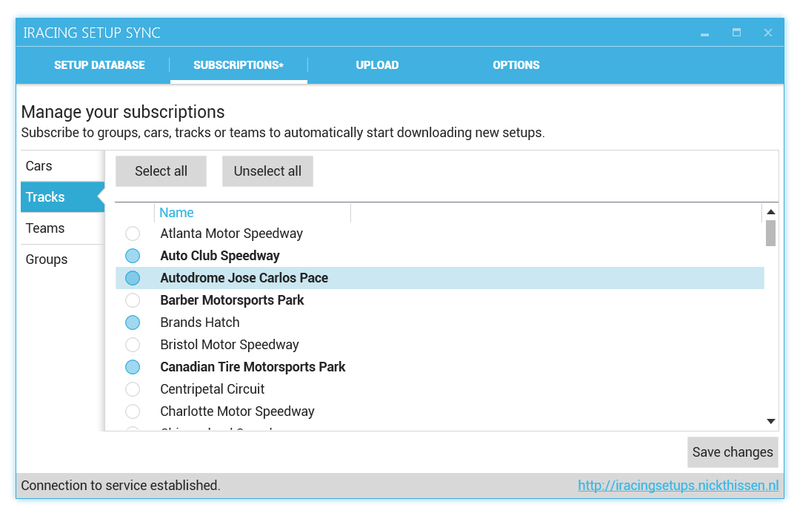 Automatically download recent setups for your current car / track, as soon as you start iRacing. Similar to Trading Paints – except for setups! Operates on a vast database of over 1,000 setups which is continuously updated by setups added to the various Setup Shops around the forums, and by user uploads. (Soon) Upload the setups you used in a recent session (if you want to share them) with the click of a button. Viewing the available BMW Z4 GT3 setups. Setups in light gray are already on my local pc and will not be downloaded. Selecting tracks to subscribe to. 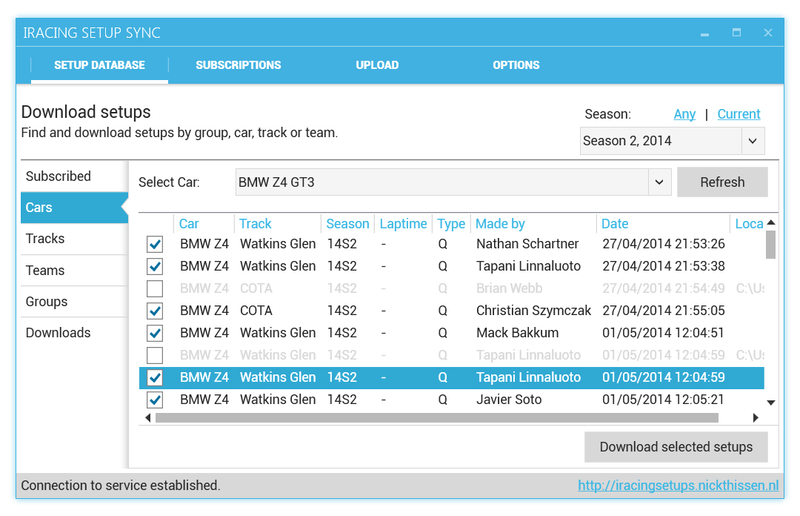 Subscribing to cars, tracks or teams allows you to find setups for those items with the click of a button. Features a very much customizable naming convention which automatically names your setups the way you want them. Next iRacing Bonus Credits are BACK!